An important addition, impeccably edited by Gareth Glover, to the already extensive literature on the Peninsular campaigns and the Battle of Waterloo, it is deserving a place on shelves of any serious collector of Napoleonic History. A whole chapter is devoted to Barrosa, of which there are few first-hand descriptions: an action `the most important feature of which’ was `the non co-operation of the Spaniards’. Although their army was no distance from the battlefield, not one of their officers `thought it necessary even to see if we were cut to pieces … not one musket was fired in our aid’. At Ciudad Rodrigo, a 9lb shot grazed Stanhope’s right leg, passed through his horse and narrowly missed his left knee.When commenting on the failed siege of Burgos and Wellington’s retirement to Portugal, Stanhope refers to the fact that the Spanish troops which for two years had been `organising in the Galicias cannot stand against French conscripts who had been 20 days from Bayonne though they have British soldiers by their side as an example’. 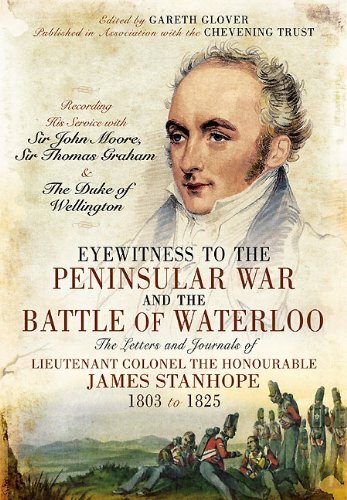 The journals of the Honourable James Stanhope are among the most remarkable eyewitness accounts of the Peninsular War and the Battle of Waterloo, and yet they have never been published before. The long fight against the French in Portugal and Spain, the campaign in Holland, then the Battle of Waterloo James Stanhope lived through all these extraordinary events and recorded them in vivid detail. He served as an aide de camp to the major commanders of the day Wellington, General Graham, Lord Paget, the Duke of York among them. And he described his experiences and observations in a lucid and candid prose that makes his journals of great historical value and of compelling interest to us today. His writing gives a graphic inside view of the military and political situation of the time as it was perceived at the top levels of the British army, and he depicts the daily experience of campaigning during the Napoleonic Wars in an unforgettable way.